In this lesson, we will learn how to find and interpret the probability of independent events. A bag contains 22 red balls and 9 green balls. One red ball is removed from the bag and then a ball is drawn at random. 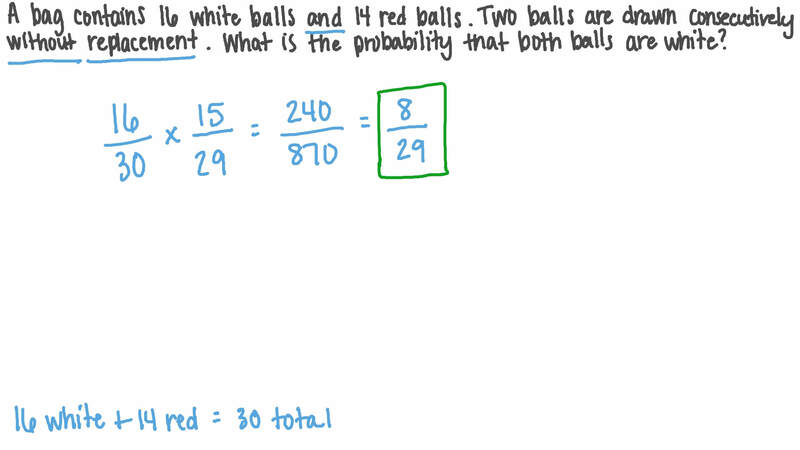 Find the probability that the drawn ball is red. In a sample space 𝑆 , the probabilities are shown for the combinations of events 𝐴 and 𝐵 occurring. Are 𝐴 and 𝐵 independent events? 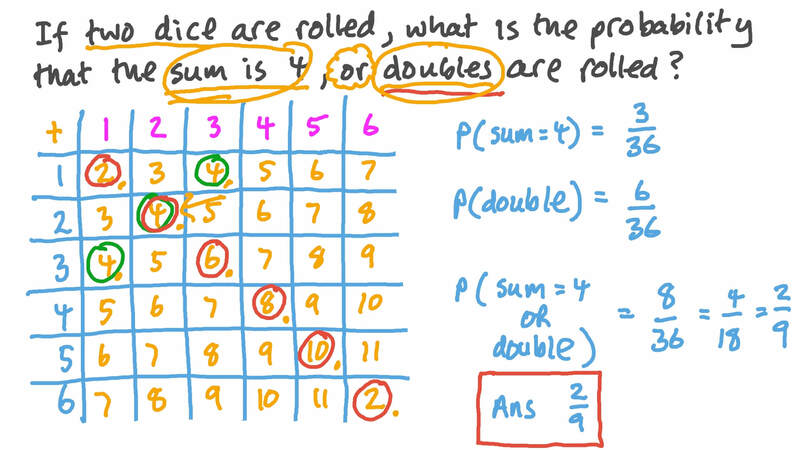 If two dice are rolled, what is the probability that the sum is 4 or doubles are rolled? A bag contains 8 red balls, 7 green balls, 12 blue balls, 15 orange balls, and 7 yellow balls. If two balls are drawn consecutively, without replacement, what is the probability that the first ball is red and the second is blue? A fair six-sided die with the numbers 1 to 6 is rolled, and a fair coin is flipped. What is the probability that the number obtained on the die is a factor of 12 and the coin lands with its heads side down? 𝐴 and 𝐵 are independent events, where 𝑃 ( 𝐴 ) = 1 3 and 𝑃 ( 𝐵 ) = 2 5 . What is the probability that events 𝐴 and 𝐵 both occur? In an experiment a coin is flipped and a die is rolled once. Event 𝐴 is the appearance of a head and a prime number. Event 𝐵 is the appearance of an even number. Find the probability of event 𝐴 or event 𝐵 occurring but not both. One letter is randomly selected from the word EVEN, and another is randomly selected from the word LETTER. 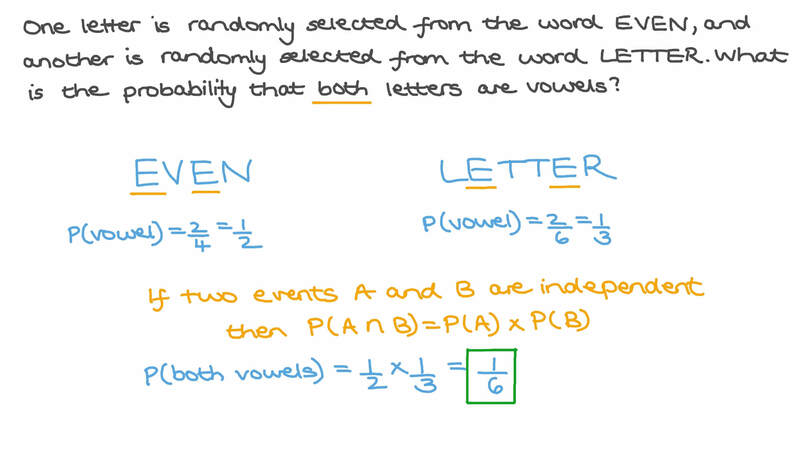 What is the probability that both letters are vowels? A coin is flipped three consecutive times. What is the probability of only getting one head? A fair coin is flipped and a fair die is rolled. What is the probability of rolling an even number on the die? An experiment consists of flipping a coin and rolling a fair six sided die once. Determine the probability of event 𝐴 , the coin landing head side up and the dice landing with a prime number uppermost. A card is drawn at random from a pack of cards numbered from 1 to 25. What is the probability that the drawn card has a number which is a factor of 10 or is even? A bag contains 10 white marbles, 7 black marbles, and 3 red marbles. If a marble is selected at random, find the probability of selecting a black or a red marble. A bag contains 16 white balls and 14 red balls. Two balls are drawn consecutively without replacement. What is the probability that both balls are white? A bag contains 6 blue balls and 15 red balls. If two balls are drawn without replacement, what is the probability of getting one blue ball and one red ball? A deck contains eight cards which are numbered 5, 7, 8, 9, 9, 15, 19, and 20. What is the probability of selecting a card at random which has a prime number? If these two spinners are spun, what is the probability that the sum of the numbers the arrows land on is a multiple of 9? A bag contains coloured balls, 18 of which are red. The rest of the balls are black. Two red balls are removed from the bag, and then a ball is drawn at random. What is the probability that the ball drawn is black, given that there were 99 balls in the bag at the start? For two events 𝐴 and 𝐵 , when is it true that 𝑃 ( 𝐴 ) ⋅ 𝑃 ( 𝐵 ) = 𝑃 ( 𝐴 ∩ 𝐵 ) ? A bag contains 32 balls. There 27 red balls, which are numbered from 1 to 27, and 5 white balls which are numbered from 28 to 32. If a ball is chosen at random from the bag, what is the probability that the ball is white or has an odd number? A bag contains 18 balls, 5 of which are white, 9 are red, and 4 are black. If a ball is drawn at random, what is the probability of the ball being white or red? The table shows the number of tyres, from a sample of 800, which needed to be replaced after a range of distances. Using the table, calculate the probability that a tyre will need to be replaced after covering more than 50 kilometres. In a sample of 55 people, 28 of them have brown hair and 22 of them have blue eyes. 5 of them have neither brown hair nor blue eyes. What is the probability that a random person from the sample has at least one of these features. A bag contains 5 red balls, 2 yellow balls, and 4 black balls. What is the probability that a ball selected at random is red or yellow?